Two new Terrier Mk2 rigs setup for percussive sampling have been delivered to customers in the UK over the last few months. The first of these, STM Environmental Consultants are using the rig for site investigation in the Reading area. 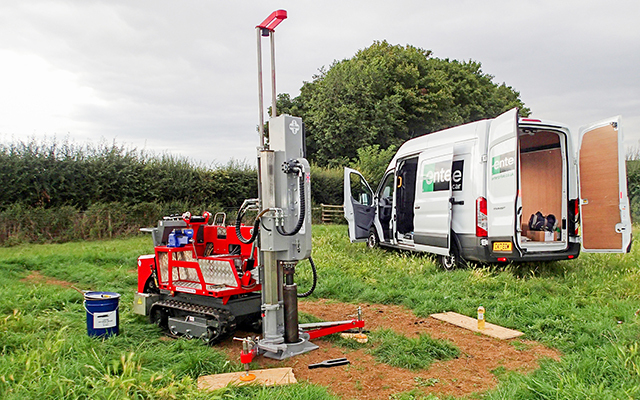 The purchase of the Terrier Mk2 rig is their first acquisition as they bring drilling in-house. Their initial project is for windowless sampling and Standard Penetration Testing at a residential area in preparation for new property development. Despite being new to drilling the STM team quickly learnt the user-friendly operation of the Terrier Mk2 system and after two days of training from a Dando commissioning engineer were sampling and SPT testing unassisted. The second Terrier Mk2 was purchased by the University of Lincoln for an interesting three-year long project researching historical flood plains in the region. Chosen for its compact size, the researchers wanted a rig that could be used with little prior drilling experience and provide the detailed geological information they require for the project. The research team are retrieving windowless samples using the Terrier Duplex Drive sampling system. Both casing and sample tubes are progressed simultaneously using this system and no drilling fluid is required providing an easy to setup operation and contamination free samples.